“U.S. Political Campaign Game Plan – Strategy I ” – June 30, 2016. 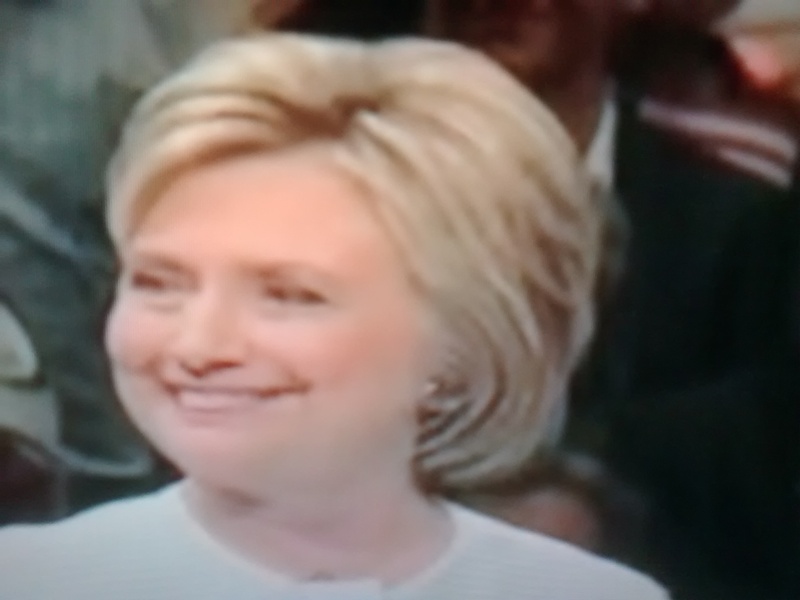 Hillary Clinton, likely presumptive Democratic Presidential nominee. Donald Trump and Hillary Clinton whose positions in the primaries remained little challenged, even when there were times that evoked doubt(s) in the minds of people regarding the invincibility of their nomination(s), have their situation now changed not just with their nominations cleared but with their ideas – campaign strokes and initiatives – strangling and forcing them to adopt fresh, innovative, ideas to win the hearts of voters. Both are now compelled to move to a different orientation with vigor and enthusiasm. Connectedness with voters is key to engagement in Politics just as connectedness with students is key to engagement in Education. 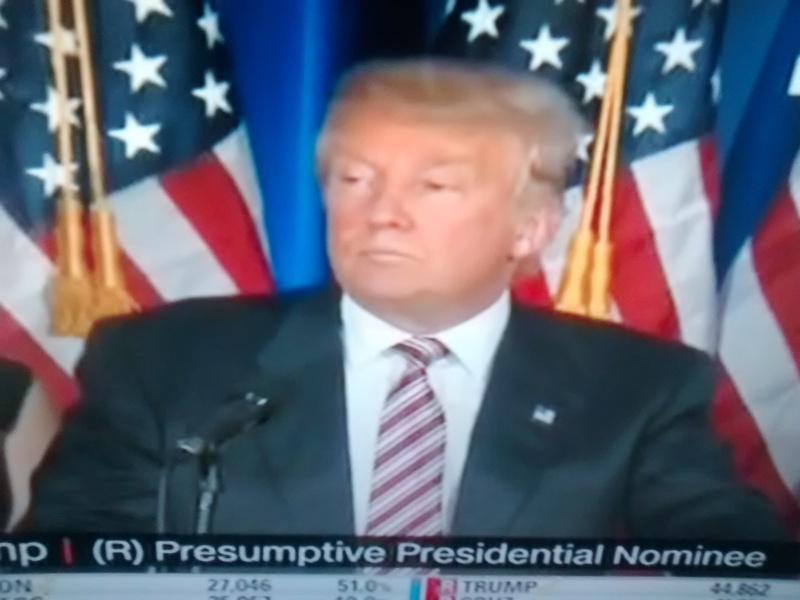 Donald Trump, the presumptive Republican Presidential nominee. This also marks the time for making favorable shifts in position/statements taken during the primaries by the contestants with the advantage of forgiveness due to the shifting nature of the contest itself (a straight contest as rivals now ). Past few weeks and the next few weeks are/will be notable for very special events with enormous potential to distract the mood and attention of voters. Twists and turns arising from their statements and counter statements every alternate day; uncertainty and financial turmoil from the Brexit referendum; U.S. House floor having witnessed the Congressional sit-in; local issues of the community staring at the local leaders; mass shootings; recent terror attack in Istanbul airport in Turkey; and the like(s). 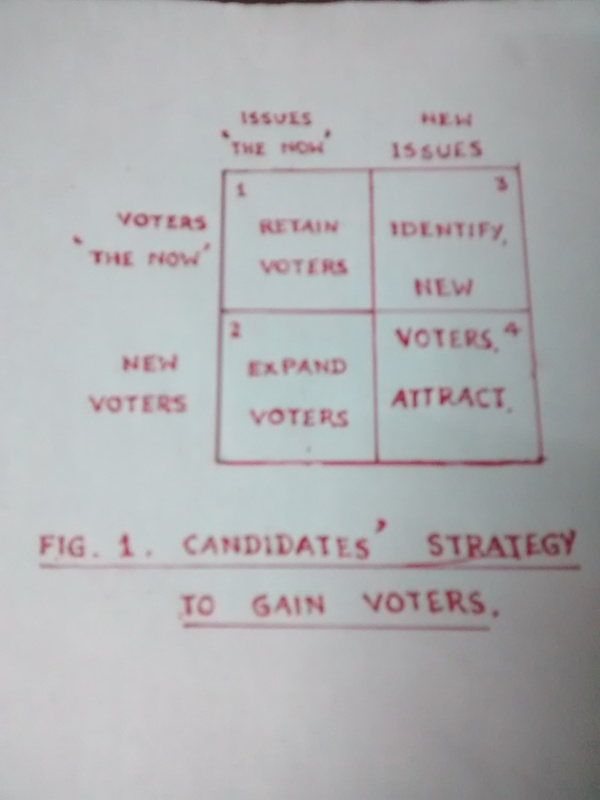 Figure below presents a simple view of the candidates’ strategy to retain existing voters and attract new voters with existing and new issues/programs. 1. Say, you’ve created a loyal segment of voters; Say, you would like to maintain your lead in this segment now: It is time to reinforce your ‘slogans’ which already made an impact adding – ” I’m the best; I’m your real leader; and we’re firmly united.” in good earnest. Simple tweak but probably will prove highly effective to the loyal voters. Loyal, they are expected to remain ! 2. In this case you will target voters who either hadn’t registered yet and those who hadn’t voted earlier in addition to fence sitters.. You’ll focus on the demography, geography, and lifestyle characteristics of the voters from the info base your party makes available. It depends upon the strength of the programs/benefits that the party advocates and embeds them in the voters’s minds, so that this new segment will be convinced that there are significant benefits in participation. Candidates may organize special meetings of the first time voters in districts presided and conducted by a group comprising “a prominent political leader; prominent local industrialist; and a prominent local academician from an institution”. This will likely boost the credibility of the candidate. (It is significant to note that in the last week’s Brexit vote, the first timers/younger voters specially in the age group 18 – 24 constituted only 34% while among the older voters it was 85%). Local agents of the parties need to manage these meets effectively. 3 and 4 in the figure deal with attracting new voters with new programs. Creating new benefits to voters primarily would aim at an innovative program tied to the quality of life of people. The central program element underlying the strategy is to establish the party in such a manner that it will be identified with the party in future. One needs to study what the common voter wants that Washington is not giving them and how his attitude can change if the want is fulfilled. Donald Trump is in an excellent position to effect the strategy either singly or in partnership with a highly resourceful new product developer, (say, an “affordable electric car” for every common man, even as I may sound crazy !) filling it with any of his business products while adding benefits of excellent durability; hazzle free maintenance; and/or a highly reliable service at no cost. Imagine making this a promise at this stage first, and when you sit on the throne making it viable in every district; in every state; in America. Well, if only the horse can fly ! The “brand” will be in everyone’s lips and the party’s presence will be firmly established. 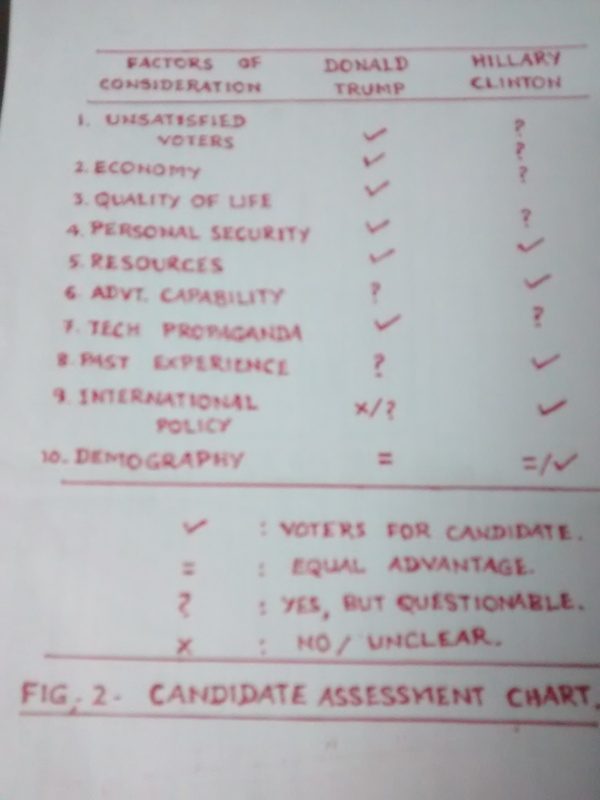 Figure 2 below shows a matrix providing a ‘subjective assessment’ of the candidates’ strength as at present. The matrix is based on my perception with no empirical data/analysis in any manner. This is likely to change as the campaign momentum picks up further in the coming weeks. The factors considered are not exhaustive and limited to only those that many analysts/experts discuss in their pieces of observations. To conclude : Whichever candidate sees an opportunity (the one new, innovative program appealing to a majority of voters ) and guides his/her campaign and advertisement pitch in this direction strongly in the next 2 to 3 months will be worth watching. Thursday, June 30, 2016 – 6. 29 p.m. (IST). Tidbit : ” Make events going better for you “.